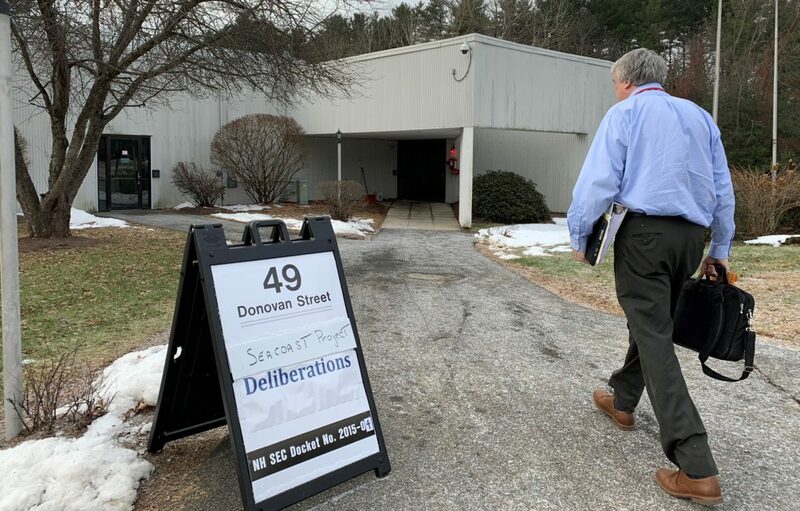 Michael Fitzgerald, Department of Environmental Services designee to the Site Evaluation Committee, enters 49 Donovan St. in Concord for deliberations on the Seacoast Reliability Project in December 2018. CONCORD – On Thursday, state regulators denied motions to rehear and reconsider their approval of the Seacoast Reliability Project that the town of Durham, the Durham residents group and the Conservation Law Foundation filed in March. The Site Evaluation Committee issued its written approval Jan. 31 for Eversource to build the unpopular 13-mile transmission line from Madbury to Portsmouth. The committee voted on Dec. 10, 2018, to grant Eversource a certificate to construct the $84 million power line, mentioning frequently during the deliberative sessions that it is a reliability project. That means it is deemed necessary to provide the Seacoast’s growing demand for electricity. The town of Durham sought reconsideration of the SEC’s decision claiming – among other failures – that Eversource failed to obtain Governor and Executive Council approval to put the cable and 8,600 square feet of concrete mattresses in tidal waters crossing Little Bay. The Conservation Law Foundation claimed – among other issues – that the public trust doctrine required Eversource to receive approval from the Governor and Executive Council to use the tidally submerged lands of Little Bay. CLF argued that, by determining that Eversource is not required to obtain Governor and Executive Council approval for construction of the project in Little Bay, the SEC granted Eversource a property right to use the lands that are subject to the public trust doctrine, according to Thursday’s order. “The town of Durham and (Conservation Law Foundation) failed to state good cause warranting rehearing,” the order states. The same arguments were raised in their post-hearing briefs and were fully addressed during deliberations, according to the SEC. The Durham residents group motion said the SEC impermissibly delegated its statutory obligation to determine the public interest as to private property as part of the dispute resolution process. In the order, the SEC said the argument offered by the Durham residents mischaracterizes the record. “The (SEC) did not delegate the authority to a third-party to ascertain the impact of the project on private property and did not shift the burden of proof to property owners,” the order states. Instead, it set forth a mitigation mechanism that will be available to the property owners on a voluntary basis. Any landowner or other person aggrieved, remains free to forgo the dispute resolution process and bring a claim in a court with jurisdiction, according to the order. “The Intervenors fail to state good cause warranting a rehearing and fail to identify facts indicating that the Subcommittee committed an error of law or that its decision was unreasonable or unlawful,” the order states. At the Dec. 10, 2018, hearing, the SEC determined that Eversource has adequate financial, technical, and managerial capability to build and run the project. The seven-member committee determined that Eversource had met all four criteria laid out in the law to grant a certificate to build the 115kv high-voltage transmission line as proposed, burying one mile beneath Little Bay. And it met the other three criteria: finding the project will not unduly interfere with the orderly development of the region, will not have an unreasonable adverse effect on aesthetics, historic sites, air and water quality, public health and safety and lastly determined that the project is in the public’s interest. Intervenors haven’t ruled out an appeal to the state Supreme Court.